I’ve spent the last few days at my parents’ place while my mom is away. This afternoon I decided to make some shortbread, but when you’re not in your own house, you often have to rummage around the cupboards to find what you’re looking for. So I was rummaging around and happened to pull out an extra set of measuring cups. I was quite surprised when, out of the corner of my eye, I noticed there was something live in one of them! 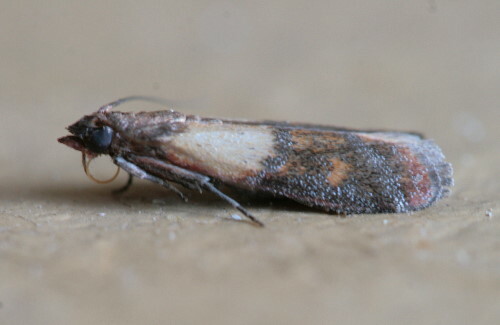 It turned out to be a little moth, only about a centimeter (<1/2″) long. 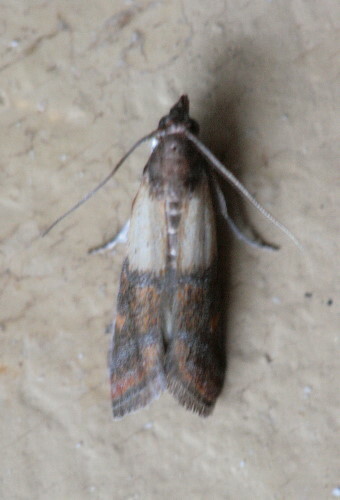 I recognized it immediately from its size, shape, and distinct pale shoulders: it’s an Indian Meal Moth, Plodia interpunctella. It’s another one of those household interlopers that usually arrive as eggs in storebought product (or adults, having emerged from eggs in the neighbour’s storebought product). In particular they like grains, though they’re not too fussy about the type. The scientist who coined the common name found them in cornmeal – which used to be known as Indian Meal. But flour, oatmeal, nuts, birdseed and even weird things like powdered milk, dried fruit and – gasp – chocolate are all also apparently fair game. They lay their eggs on or near suitable food; the eggs will hatch in 2 to 14 days, depending on temperature, and the caterpillars will take 2 to 41 weeks to grow, pupate and turn into moths, again depending on temperature. If they came in with your storebought product you’ll know soon enough after bringing it home, but if an adult finds it and lays eggs at a later date, it could turn up at pretty much any time. It’s a very pretty moth up close even if it’s a troublemaker. My parents actually had these infest their fall harvest of garlic which was stored in a paper bag.